Since the children were very little, it’s always been our fall ritual to go apple picking with our friends the Feinbergs. He and my husband were groomsmen for one another in our weddings, and we’ve known each other’s kids since birth. The outing is now a part of our traditions together, another piece of fabric sewn into the quilt of our friendship. 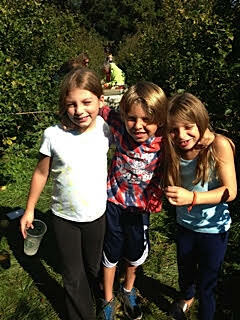 We load up the minivans and head to Wisconsin for some hay rides and tree climbing in the orchards. 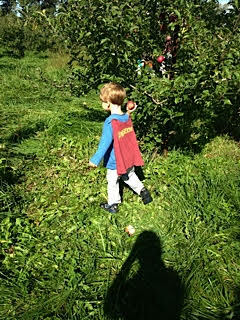 With each passing year, the kids become more independent, better able to navigate their way amidst the trees and pick the best apples offered. They used to require a boost to reach the upper branches. Now we watch them scurry up on their own. Tasting the fresh fruit and feeling the juices run down our chins, signals the arrival of this most beautiful season, just as much as watching the leaves change and seeing the pumpkins arrive on doorsteps. This year, when I call my friend to find a date, we both quickly become dismayed as we tick off weekend after weekend and realize one if not both of us has a conflict. Thankfully, they are good excuses, but how can this be? The demanding schedules of work and kids for both families have always proved challenging for making the trek. Still, somehow we always find a sliver of time to carve out for this annual ritual. If we don’t pick apples together this year, fall won’t feel quite the same. And this is the fall I turn 40. I’m craving these little slices of life right now. My nostalgia and wistfulness seem to be in peak form as I approach this new decade. Every fall I prepare to blow out another candle on my cake, but I’m usually so engrossed with planning my daughters’ celebrations, since they share this birthday season with me, that I don’t give mine much thought. Turning 40 has been different. I’ve been obsessed with the fact that I’m reaching this milestone age. I never enjoy when people act as if they are the first ones to endure something, but I’m afraid that’s exactly how I have been when it comes to this birthday. I’m one of the younger ones among my friends, so I’ve been watching others celebrate their 40th throughout this year, and the years prior. I’ve seen how wonderful they look and how satisfied they are with their lives. I should have nothing to fear. Yet instead of running to embrace it for myself, I’m tiptoeing my way there. Every hour, every minute before the actual date means one more moment of being in my 30s. I feel my grip on 39 loosen with each passing day, but I refuse to associate myself with 40 until the clock turns midnight on September 23. Maybe it’s because I’ve always been a planner. I enjoy setting goals and working toward them. With each decade of adulthood so far, I’ve had in mind what I wanted out of life. In my 20s, I set my nose to the proverbial grindstone as I honed my career in journalism. I sought out my life partner and found him in an old friend. Those two achievements propelled me into my 30s, my decade of motherhood, another goal I reached right around the time I envisioned for myself. Now, here I am, counting down to 40, unsure of my next plan. I have new objectives for my writing and for my family. But unlike the earlier decades of being a grown-up, everything seems a little fuzzier, and not because I need reading glasses. (Though I’m worried I do). I lament to my parents how strange it feels to no longer be young. My mom reassures me that I am still young, and if nothing else, I’m in my prime. I take her point. Even though I feel less sure of where I’m going on this path called life, my footsteps feel more secure than they did in earlier years. Forty can do that to a person if she’s lucky. Life is always changing, and I do know now that while goals are admirable, it’s also a good idea to be flexible and not make too many plans. Yet there are some plans I can’t do without. Like apple picking. More than ever, I need that tradition. This fall, as I turn 40, I feel changes in the air different from those I usually experience at this time of year. So I’m determined to get us to the orchards. I’m yearning for the crunch of leaves under our feet and the taste of freshly plucked apples between our teeth. Technically, I may no longer be young. But my children still are, and I want to keep making these memories together. 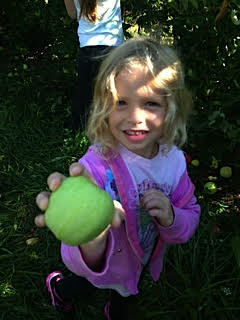 Would you believe we’ve never been apple picking? Not a lot of apple orchards down here:(. But we do have a family tradition, which we share with another family (former neighbors), of going to a pumpkin farm/hay ride and the a picnic at Amicalola Falls. We’ve done this every year for the last 8 years. They have three kids, we have four and it is so hard to schedule. We almost decoded to pull the kids form school one day to get it done:). But we found a Sunday morning that was free. Turning forty – I had a blast. I swear it was more fun than begin a bride. I celebrated for TWO weeks. Dinners out, a party, a surprise party, two trips – I barely felt the pain. Now 41, that sucked. Oh, I love those fresh, crunchy, taste-testing fall traditions. Yes, keep it up with all your might! As for your age, think FORTY AND FABULOUS! Which you will be, I’m sure. My friends and I are all in our mid to upper 40s now, but there are a couple looming at 40, and we, of course, refer to them as the pups. I can relate, though, to that nostalgic sort of hanging on to the last hour, the last morsel of a moment in time, knowing I can never rewind. But, that’s a big part of why I write. To preserve the moments into a timewarp. My daughter and I, by the way, made our first homemade apple pie last fall. Such a fun thing to do together. Hopefully we’ll do that again this year. Have a great day Mimi! Thanks Julie! I think that’s a part of why I write too. I just wish I’d started sooner when my little ones were even littler. Sometimes I feel like I want to freeze time and keep them at these ages until I’m ready to let go. I think that’s part of why this whole 40 thing is challenging. It drives home how quickly the years are passing. Okay, not fair! I was waiting for the denouement, where you revealed how you finally managed to find a date to go apple picking — but you left us hanging! So how did it end? Were you able to find a weekend? I must admit that, as I am looking at 50 in some of the same ways you are looking at 40, milestone birthdays can be a time to step back and reflect on our life paths. You seem happy and delighted in the paths you’ve take in your 30’s. So I feel confident that you’ll find your 40’s to be fulfilling and wonderful. Thanks Anna! And I agree about the milestone birthdays and reflecting. In fact, I’m talking about that in another essay I wrote on this subject coming out next week. Stay tuned… 🙂 As for the apple picking, we actually considered going super early this past weekend, but the hubbies kiboshed it, which was actually the right call even though I loved the idea of early morning at the orchards. So far, though, we are coming up with nada. 🙁 Will let you know if we make it there. Thank you for your kind words and encouragement about my 40s! Right back at ya re: 50! You may be turning 40, but your picture and the energy in your writing sure says 29! I think milestone birthdays are hard for everyone. In your 20’s you crave freedom, in your 30’s you crave purpose and 40’s you just want the world to stop for a little while while you embrace your beautiful life. It is hard to accept that we are getting older. Suddenly we wake up and we aren’t 22 anymore. Life rushes by with each passing year, but we need to be reminded ourselves how lucky we are to have had those first 40 years and all the memories that came with them. The next 40 are your for the taking. Life is good my friend and you’re rocking it! Love your wise words Danielle! You are so spot on about all those decades. And I so appreciate all your kind words regarding little ole me. 🙂 Thanks for joining me here! I loved this post in honor of your bday, which has no passed. You should write about having your birthday on Yom Kippur! Could be a good Kveller post for next year. File it away! Why, oh why, do you not show The Christmas List several times during the countdown until Christmas?